Two Body Problem: Installing MCE, like its 2005! Installing MCE, like its 2005! Only 52 more updates to go! It's been a while since I posted, but a few months ago I got fed up with my HTPC and banished it from the theater. It ended up in the den, where it's my Skype and guinea pig machine. What I like about an HTPC is you can potentially have one playback device that can do everything. On the downside, I could never get it to be as seemless as I would like. When it was time to watch a movie, my wife would send me out 20 min in advance to set everything up and fix any problems that would pop up. Eventually, it got to be too much, even for me. The current playback devices in the theater are a Xbox 360, a Samsung network-connected blu-ray player and a WD TV Live Plus. The workhorse of the theater is the WD TV. This little guy can play back almost anything I throw at it. In my case, I stream videos to it off two NAS drives. I'm not 100% convinced this is the best way to go, but it's what I'm doing for now. I could stream to the blu-ray player, but it doesn't always play nice with MKV files (it works better with a connected USB drive) and I don't care for the user interface all that much. I like the look of the Xbox 360, but Microsoft is very particular about the files you can stream to it, and most of my files wouldn't make the cut without decoded them in an undesirable way. The downside with the WDTV is the interface isn't particularly pretty. With alternate firmware you can change this, and I played around with this back with my generation one WDTV, but I haven't done it yet with the 2nd generation WDTV Live Plus. One deficiency I have in the current set up is I don't have a way to watch live TV. I have a 1st generation HDHomerun (HDHR) which essentially makes two over the air or unencrypted cable tuners available over the network. With the HTPC I was able to use the HDHR to watch broadcast TV, however, I couldn't stream from the HDHR to any of the other playback devices in the theater. In an impulse buy I purchased new HD Homerun Plus. This device promises to transcode video on the fly to stream to any of your devices, but I couldn't get it to work very well. Granted I didn't try very long, but for what I wanted it for, this purchase was overkill and I sent it back. I also have a USB TV tuner, WinTV-HVR-950Q. This will also work only with the PC. I feel stupid for not thinking of it sooner, but it turns out I have everything I need watch broadcast TV in the theater. 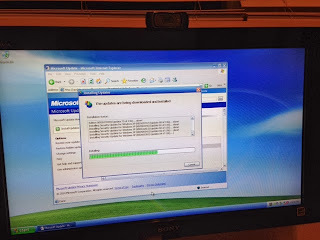 All I have to do is reinstall Windows XP on the former HTPC, specifically Windows XP Media Center Edition 2005 (MCE). It so happens I have a legitimate copy of this, from back when I first got into HTPCs back in, well, 2005 or so. If I set up the PC with MCE and the USB TV tuner I should be able watch broadcast TV via the Media Center application on the Xbox 360. The key word here is "should". I'll report back when I'm done installing the 136 updates, software, drivers and rebooting 12 times. If it doesn't work, I have a few ideas about what I can do instead.